We are fast approaching the 2019 golf season. Improper use of a golf cart can cause damage that can be lasting all summer. Tim Moraghan from Aspire Golf wrote a great article on golf cart usage. Please take the time to read it and heed his advise. 1. Cart paths are there for a reason. There is no need to drive or park anywhere other than on the path when conditions warrant. 2. Pulling off the path approaching tees and greens wears out the turf close to the paths. The more the turf declines, the more drivers creep closer to areas where carts do the most damage. 3. If you belong to or play at a course that is part of a community, obey traffic signs. A stop sign means just that: Stop! A 400-pound plastic golf cart meeting a 3,000-pound metal automobile is not a pretty sight. 4. Even if you’re the only one out on the course in the early evening, even if there’s no one else around, it’s still not OK to drive wherever you want. No one might see you, but the turf will still be affected. 5, Ropes and stakes are not there to create an obstacle course for you to have fun driving over, around and through. They are there to keep you safe and keep the turf healthy. 6. Same with speed bumps, curbs and rumble strips. They are there to get your attention and keep you safe. And stone-risers on a curve and by the greens are not there to tell you when it’s time to leave the path and go closer! 7. 90 degrees means 90 degrees! 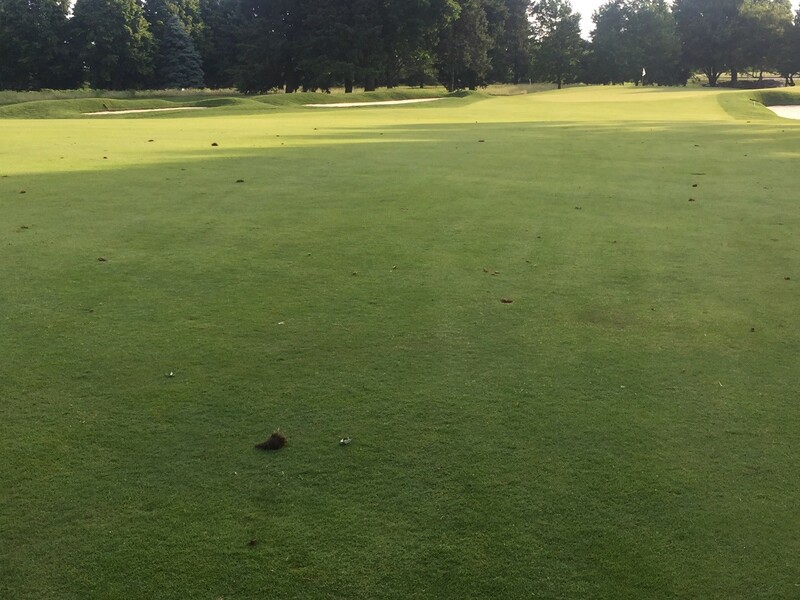 Golfers who drive on the course after aerification, Fraze mowing, a rain event or other anomalies are asked to go straight over and straight back for a reason. No meandering, no venturing into a “cone of uncertainty.” And in case you’ve forgotten your high school geometry, 90 degrees is a right angle, a straight line to your ball and back. Right angles are not 70 degrees or 110 degrees. 8. Having a special flag on your cart does not give you permission to drive across the putting green or through puddles and native areas. It’s supposed to mean you have a legitimate disability, which allows you some special privilege and leeway. How much is simple common sense. Don’t roll over the flower beds or take a tour of the bunkers. Don’t park with one tire on the green and don’t drive through the fine fescue. Stay as close to the paved surface as possible and do not venture into any protected areas. 9. Water is going to collect in low spots, but that doesn’t mean you have to drive through every body of standing water on the course. Steer carefully around the puddles and the cart, the course, and you are more likely to be OK. And just because you see someone else pretend he’s on the flume ride at the amusement park, doesn’t mean you have to make your own waves. 10. Signs that ask you to “Enter Here” and “Exit Here” along the cart paths are there for a reason. Yes, the superintendent is trying to make his life easier, but he’s doing that so the course doesn’t take the brunt of bad driving. 11. Driving over sprinkler heads and next to fairway bunkers can cause a lot of damage, which means repair and maintenance, with the costs ultimately passed on to you, the golfer. 12. If you’re looking for a ball, don’t park the cart at the furthest point and walk back, abandoning the cart and ignoring players behind you. If there are two of you in the cart, one of you should get out and walk while the other searches in the cart. And when you do find the ball, leave your cap, towel or head cover close by so you don’t have to search all over again after getting a club. Not only will you do less damage to the course, but you’ll help speed up play. 13. Keep your legs and feet in the cart. You’d be surprised how many legs and ankles are broken every year by getting caught between the cart and the curb. Watch out for overhanging branches, too. Here is a photo of a person who didn't keep their foot in the golf cart. This person is lucky to walking normal again. As the winter drags on, I thought I would take the time to write a little about what is happening in our department. 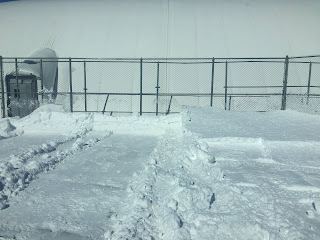 Many of you know it is our responsibility for the snow removal at the club and around the tennis dome. 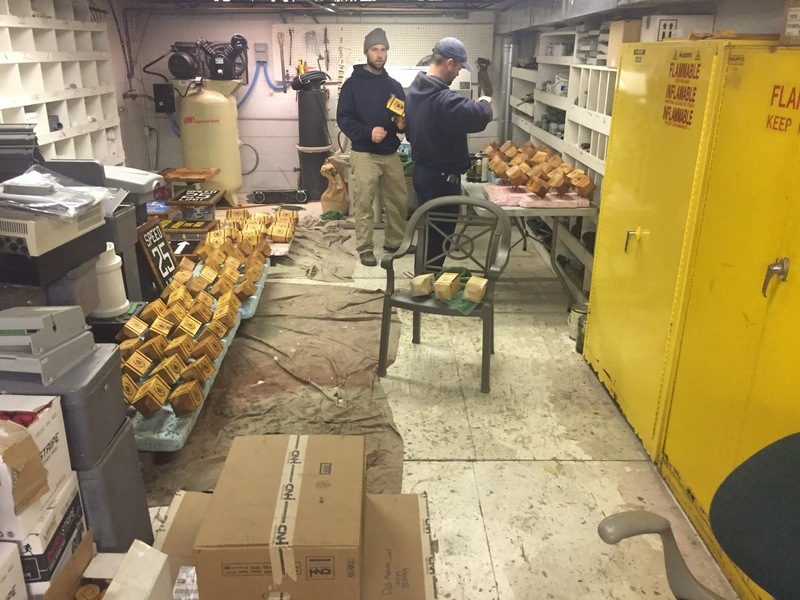 The difficult part of this is the maintenance shop is a long way from where our responsibilities lie. We have ½ mile maintenance road to negotiate in the event of blowing and drifting snow. While it most times it is not a big deal at times it can be a big deal. Last week during the heavy snows we had one of our employees get to close to the edge of the road and the truck got a tire just off and we had to call in a tow truck. 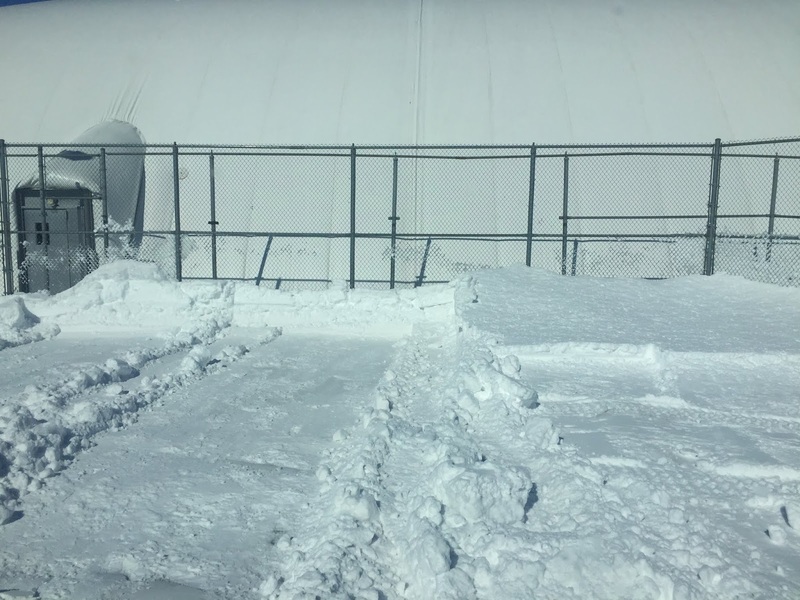 The heavy snow fall has also been a bit of an issue at the tennis dome. If you think about the dome it is 70’ from the bottom of the dome to the top, so a 1” snow = 70” piled up at the bottom. We used shovels to get the snow away and then we snow blow it out. 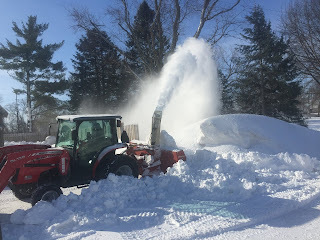 Usually not an issue for us but twice this winter we have had to go out on to the area where we blow the snow and pull it all back to give us more room to blow more snow. Not a typical problem for us but this winter is a bit unusual. There are several areas where the snow piles up and we must take the time to blow it out of our way to allow for more snow removal. If we did not have this tractor mounted snow blower, we would have huge piles of snow all around the parking lots. This one piece of equipment has been an invaluable tool for us in our snow removal. 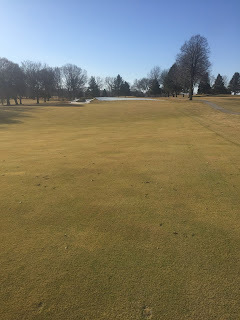 We had a big thaw the last week of January at that time the turf looked very good under the greens covers. Then the snows of February came, and we have been covered up since. We were out of the golf courses yesterday and we do have a small layer of ice under the snow but it is very porous so we don’t think at this time there will be any issues. Looking forward to a big melt soon but the temperatures are not very conducive for it in the 7-day forecast. We are very aware of the new rules of golf that we are all going to experience this spring. We have been working several years with a great Iowa based company called Standard Golf Company out of Cedar Falls, Ia. One of the new items in their line this year is a narrow flag stick at the base to allow for more room for the ball to get into the cup if you choose to leave the flag stick in the cup. We will be using these flag sticks for the season. I would appreciate your feedback on them if you have any ideas or thoughts on their performance. One of things we have done for several years is to collect the sap from some of the maple trees on the golf course. We boil this sap down to make maple syrup. We then usually do a breakfast with the pro shop staff to kick off the season. Cooking down the sap is a very long process and it can be costly to me because I supply the propane cooker to do this. 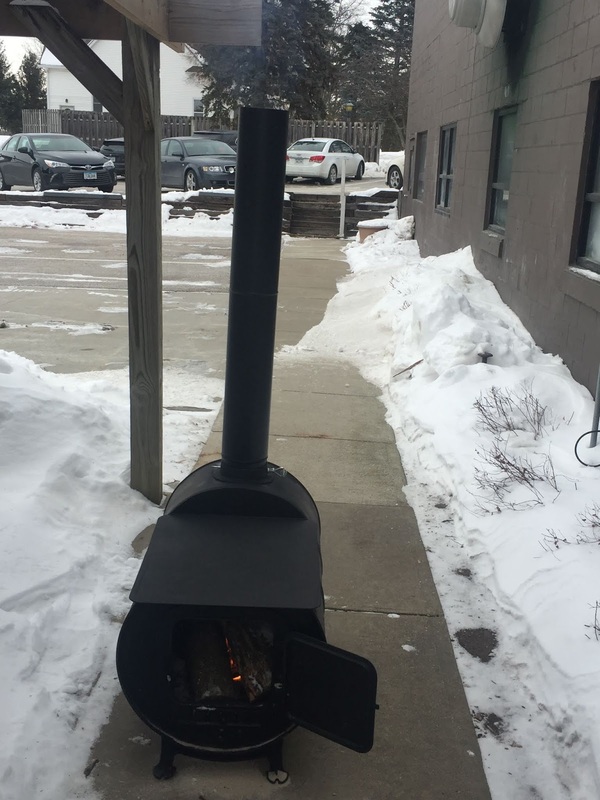 This year we built a wood stove to do it. We have plenty of firewood to use and this should make a little less expensive once the sap starts to run. We are now back in the maintenance shop finishing up some small detail projects. 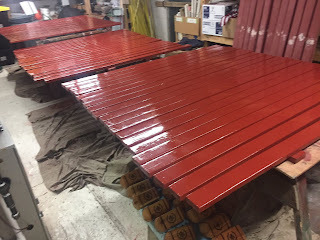 We will be painting the interior of the shop. We will be doing the walls and the floors. This is something we try to do every couple of years. It is always nice to have a clean and well-organized shop to work out even if it is an aging building. That is all for now, hopefully my next blog posting will be about the golf courses and you getting ready to play golf. It has been a long time since I have posted on my blog page. I heard about it from some members who say they missed the golf course updates and Twitter pictures/comments were not enough. So, now it is time to once again try to bring you timely updates from the golf course. It has been a great winter for us in the golf course maintenance department, despite the ugly weather that we have endured over the last 10 days. We were able to be out on the golf course late into December and prune some trees that needed some attention. We also had recommendations from Tim Liddy our golf course architect to remove certain trees on a few holes to open the playing corridors to make them more playable. I will let up see if you can tell where they were removed once you get back out this spring. We have had 2 fulltime positions open since last May. It is becoming extremely difficult to find young people that want to be in this profession and do the work. Over the winter time I feel very fortunate to fill both of those 2nd assistant superintendent positions with some very good candidates. Cree Slough was the golf course superintendent at Clarinda Country Club in Clarinda, Iowa. Cree wanted to broaden his work knowledge and staying in his home town was not getting it done for him. Jeremy Grefe was working at Blue Mound Country Club in Milwaukee, Wis. Jeremy is a native Iowan and he too thought coming to DMGCC would be a good move for him to further his career. Both gentlemen started in January with us and we are delighted to have them here working with us. Our mower grinding is nearing completion. We just have a few bed knives left to grind and the mowers will be ready to go for 2019. Our paint booth has been extremely busy and that too is now wrapping up and we will be putting together all of the ball washers and benches. They look awesome, Rueben Robles our in-house paint man does a great job of painting with his paint gun. Other guys have been busy making new tee markers and painting bench boards. Before all of these items can ben painted, they are sanded down to remove the old coats of paint and to rough up the surface a little so the new paint can adhere to the fixture. I am thankful that we have not had a tremendous amount of snow because the snow fall causes us to leave the shop to handle the snow removal and then we fall behind with indoor items. The 6” – 8” that we do have on the ground is a nice insulation blanket against these frigid temperatures that we experienced this past week. The turf looked good before the snowfall. We have our annual Golf Industry Show next week in San Diego. I am looking forward to going this year. A few things on my radar screen are to look at new seed/soil boxes for our par 3 tees. The old ones are in bad condition and we need to upgrade to a newer one that will hold up and look nice. I am attending a seminar on GPS sprayers and trying to learn that technology. I find it very interesting and the claim of these industry people is that you will save $ because of the accuracy of the sprayer. We have retro fitted one of our units this winter and look forward to trying them out. It has been extremely difficult over the last few years to find employees for our seasonal crew. There is a big move in our industry to go to fully autonomous mowers for greens and fairways. I expect a big push from the manufactures to have these units for us to look at the Golf Industry Show. I will update you on these upon my return. I hope to update you once again on a regular basis, so please check back and see what we are up to. Thank you. 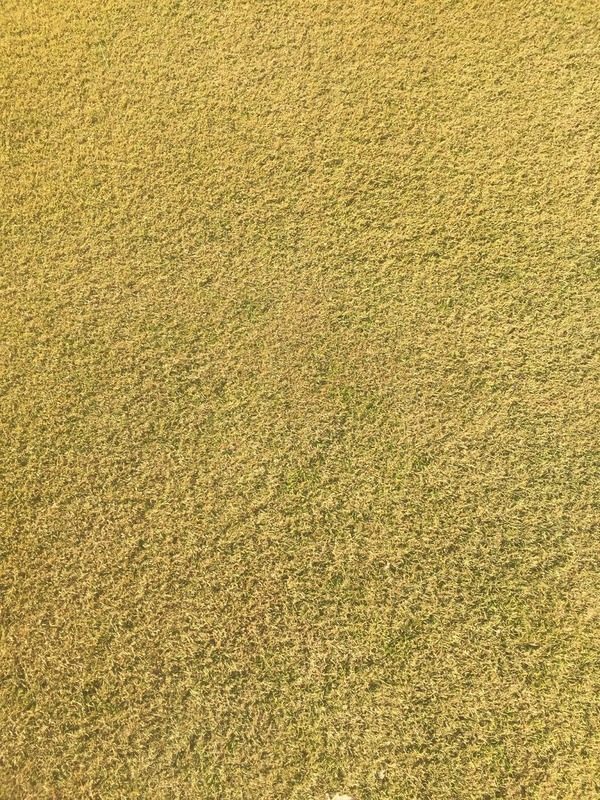 It is very disturbing to go around our golf course and once again see numerous ball marks not repaired, divots laying out on the tees and fairways and just general lack of care by the golfers this past 3 weeks. I understand that the golf courses have been recently aerified but it is incumbent upon the golfer to do your part in taking care of the golf courses. On behalf of the Des Moines Golf and Country Club we want to welcome you to our club. We also have some reminders that we feel are important for you to know about while you are playing our facility. 1. Retrieve all possible portions of the divot, replace it carefully. 2. Step down on the divot firmly once replaced. 3. If you have sand/divot mix available for use (on golf carts) please use it to fill around the edge of the divot and fill any void areas. 1. It is preferred that you use the Pitch Pro tool that is provided to you at the starter stand. 2. Inset the point or tip in several different places around the ball mark and gently push towards center. 3. DO NOT LIFT OR TWIST THE TOOL WHILE IT IS IN THE TURF! This can do major damage to the root system of the turf. 4. Once pushed together gently tamp down the pitch mark area. 5. Whenever possible repair and extra pitch mark if you see one! It is our pleasure to have you come and play Des Moines Golf and Country Club; we would appreciate your respect to these matters listed above and enjoy your golf at our facility. Please remind others in your group to repair the ball marks and divots, by doing this our golf course will be in much better condition. Lastly we have the red stakes for a reason - to properly manage the golf cart traffic around greens and tees. Please follow our red stake rule. As a reminder: No carts should be off the paths on all Par 3's. Even if you have a blue flag you should be on the paths playing a par 3. If you are following these simple rules - thank you. If you are not please do your best to help our your fellow golfer and remember to fix ball marks, replace divots and follow our red stake rules. In less than 70 days our golf courses will be seen on the world stage. Work has begun on the build out for the Solheim Cup and all Club departments are very busy preparing and planning for this world class event. On the golf course, we really need your assistance to help us have the golf course turf in the best possible condition. I would like to remind you of a few golf course care tips we ask you to use in your day to day play. Please replace any divots you take or you see not replaced. 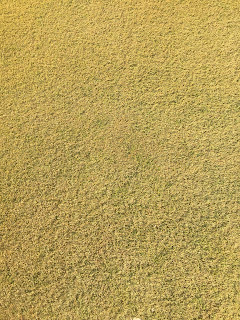 Whether it’s on a tee or a fairway, replace the divot. If the divot is too fractured to replace, then please use the sand bottles provided. We should never have fairways look like this one in the photo below the morning after a busy weekend. This year we have seen more golf cart violations than ever before. Remember, enter the fairway at the red stake and return to the cart path at the next red stake. Then stay on the path until the next tee; do not cut through roughs to get to the next tee. Golf carts, when not used correctly, are one of the worst wear items for the turf. Please obey our rules for cart usage and remind those you are playing with to do so as well. Many of you have no doubt seen the merchandise tent and opening /closing ceremony bleachers being erected by the West Range. Construction will move to the 1 st Tee (#10 North) on Monday, June 12. Material for this construction will be stored in the no-mow next to #11 South and an area north of the East Range. This will result in us closing the East Range and the East Range practice green during this time. It is estimated this work will take two weeks, at which time the East Range will re-open. Please be mindful of the construction traffic and the fact these areas need to be treated as construction zones; closed to member traffic. We appreciate your cooperation in advance. Course restrictions for the Solheim Cup are still several weeks away but we want to make you aware of them. On the Championship golf course there will be some restrictions for the use of Solheim Cup tees after the Member/Member tournament. Golf carts on the Championship Course will be restricted to paths after the Damsel Duo on August 2. The LPGA Rules Official has asked that we not paint any hazards after July 4 th so as not to interfere with the lines they will be painting for the event. So after July 4 th only hazard stakes will define the hazards. Also beginning in July we will be increasing the heights of primary rough at their request. Thank you for your help on these matters and we hope you enjoy your summer at the Club.